So skilled a violinist was young Ernest Blumenschein that he made a living for a time as first violinist in the New York Philharmonic under the baton of Antonin Dvorak. The concept is called synesthesia - where one of the senses is described metaphorically in terms of another - a "loud tie" is a good example; the "Blues" is another. 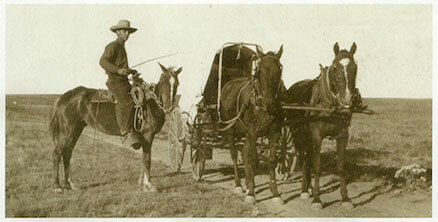 Ernest L. Blumenschein en route from Denver, Colorado to Taos, New Mexico, 1898. Courtesy Palace of the Governors Photo Archives (NMHM/DCA), HP.2005.25.1. Consider Little Rio Grande Landscape. If this were music - and there is something distinctly musical in the design of the work - trees like notes marching across a score - it would be, according to Blumenschein's scheme, a tone poem of strings and reeds. The ducks offer hints of melody and the unseen river - where the artist often fished with John Marin, E. Martin Hennings, and Ward Lockwood - provides a kind of continuo. But the reliance on repetitions, ever so slightly varied, align the music with modernist composers like Philip Glass and John Adams, and this is Blumenschein's genius: His ability to look forward and embrace aspects of modernism while remaining faithful to the bedrock of his classical, 19th-century training. Music is one of the foundations for the bridge. Ernest L. Blumenschein, Little Rio Grande Landscape, oil, 24" x 27". Courtesy of The Owings Gallery, Santa Fe, New Mexico. Looking at the artist's balancing act in another way, if design is Blumenschein's philosphy, his academic, classical training in Europe is the palette where his emotions reside. The geometry of Indians in the Mountains, a tapestry of interwoven angles, derives from light as it affects the colors of the peaks, the plain beneath, and the band of mounted Indians. The dramatic light embroiders the snow-dappled green and purple slopes, casting deep shadows. The effect is tectonic, as if we are witness to drifting continents, initiated into geological scales of time. From blues to reds, the Indians ride against the drift, the stripes of their robes continuing and mirroring the form of the mountains. The music of the painting is the sound of the drum that percusses in the heart of the earth. 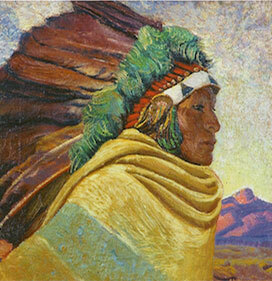 Ernest L. Blumeschein, The Red War Bonnet - Red Deer, oil 14" x 14". Image courtesy of Scottsdale Art Auction. Like some of the modernists - Arshile Gorky, for example, with whom he exhibited in New York in the late 1930's - images of genesis abound in Blumenschein's paintings. The Red War Bonnet - Red Deer, for example, is a study in birth, in the connection between an individual and his or her culture, constructed on a single diagonal that runs from lower left to upper right. The square, 14-by-14-inch canvas allows the work to rest on a solid architectural frame. The diagonal divides the work into two equilateral triangles whose hypotenuse runs along the robe between the beaded brow band and the base plumes wrapped in red. The warrior's profile, right of the center of the canvas, suggests forward movement, a brave striding into the future, even as the eagle feathers buzz and hum and sigh in the winds of the past. But the effect when you step back from the work is simultaneously mythological and biological. Inagine the folds of the robe at the warrior's throat, the rosette and side feathers over his ears, the bands of white and red above his brow as the generative organ of some ancient god and what we see is the culture giving birth to the warrior, who emerges clear-eyed taking his surroundings in without emotion. The distant pink peak becomes a breast - the land that will nurture him. In Gorky, bioforms constitute the work while Blumenschein disguises his, but their impulses are similar. Ernest L. Blumenschein, Girl in Rose, oil, 30" x 25". Image courtesy of J.N. Bartfield Galleries, New York City. 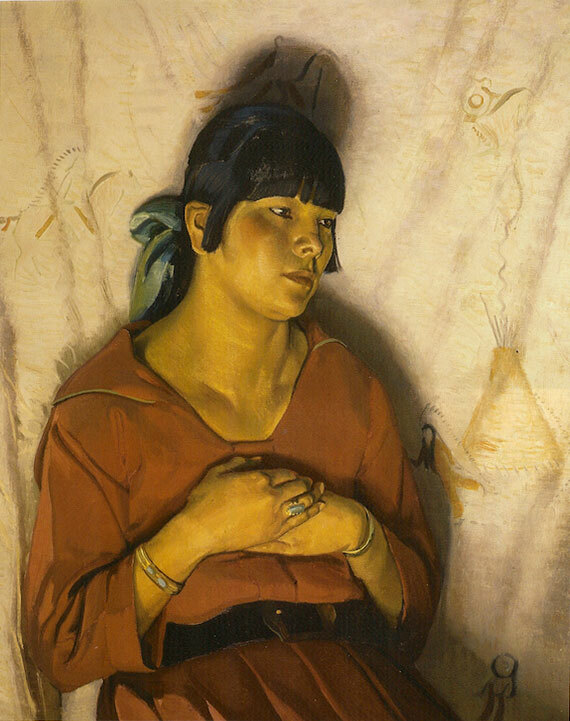 Blumenschein's interest in Native Americans, their art forms and imagery, and the effects of modernization on their culture are congruent with the modernist fascination with tribal art and the recent rise of anthropology as a serious science. During the time he lived in Taos, the artist bore witness to peoples whose ways had evolved over millenia; he also saw the rapid transformations the 20th century brought to the timelessness of Taos. Girl in Rose, a stunning portrait, seems light years away from the tenets of abstraction. While she sits in modern, Western dress, the teepee lining behind her, with its ledger painting glyphs, points, in a subtle way, to her past. She herself is caught between them, between past and present. 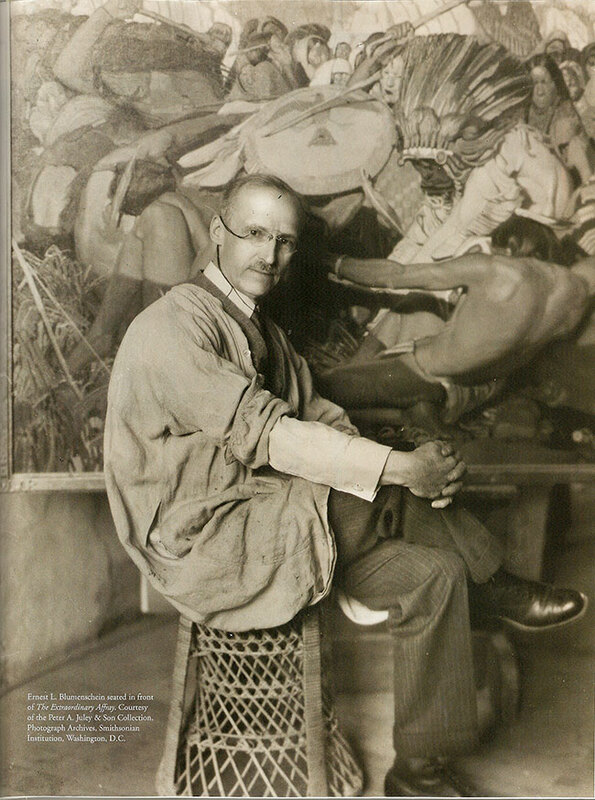 Digging deeper, Blumenschein's portrait is also a painting of a painting. The glyphs, in a traditional Native American style, mirror the portrait, which is painted in an academic, classical manner. Like the sitter, the artist straddles two worlds. In the dream-like Homeward Bound, Blumenschein paints the Indians and ponies in profile as flowing shapes that seem to have unrolled and stepped off the undecorated teepees scattered in the rhythmically undulent brush rather than merely including Native American design elements. 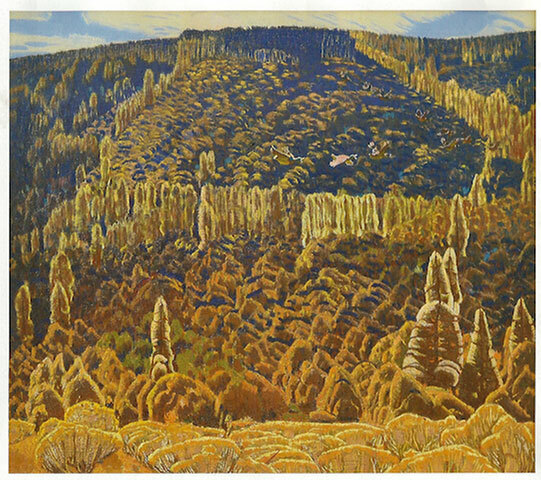 This band of Indians, Cheyenne or Apache, perhaps - who did visit Taos from time to time - seems to transform the landscape and Blumenschein's aesthetic as he adopts and adapts the pictorial strategies of the people he paints. Our eyes rest on the chestnut horse tossing its head for joy, then move up the picture plane to the brilliantly lit cloud that dominates the sky. Like something out of Close Encounters of the Third Kind, the wide brushstrokes and pulls of paint across the canvas give the luminescent cloud an otherworldy phenomenon, a benediction of sorts, the illusion of mass. At left, in a truly lovely gesture, Blumenschein paints the waxing moon in the phase that is referred to as the "old moon in the new moon's arms." Perhaps he is the old moon in the arts of the new - the modern. Or perhaps he is that silver of new moon, his spirits renewed as he wraps he arms around the art of the Indians he paints. What instrument might the great painter have heard in that moon? Hard to say. Something ancient - the lyre, perhaps. Or a simple reed linstrument like the recorder. Hard to say. This much we can say: Ernest Blumenschein never abandoned the old instruments, but he did hear the music in the modern.